My initial involvement in political campaigns was in 1978, when I was in my second year of undergrad, and I volunteered and worked for a couple of candidates. But I really scratched the political itch when a great guy named Gene Evans, the McLennan County Democratic Party Chair, took me in and let me do things around the headquarters. He also went out of his way to introduce me to so many people that were involved in politics as candidates and in a variety of other ways. That was the year I first met former U.S. Senator Ralph Yarborough. I spent lots of time with then-Attorney General and candidate for governor John Hill (later Chief Justice of the Texas Supreme Court). I also met Mark White, who had resigned as Secretary of State in 1977 to run for attorney general in 1978 and would become our governor. My 1978 experiences stick with me even today. I still remember and use specific lessons, things I was told by people I connected with 40 years ago. 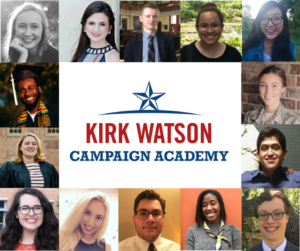 This morning, we’re kicking off the first day of the 2018 Kirk Watson Campaign Academy with 14 young leaders who want to make a real difference. My 1978 history is part of the reason I put on this academy. For the next six weeks, we’ll be working with these future leaders to introduce them to the nuts and bolts of political campaigns as well as some great state and local Democratic leaders, journalists and others who help shape public policy. And the participants will have the chance to apply what they’ve learned during field work that helps me (yeah, I’m on the ballot this year) and other candidates on the ballot. Neal Whetstone, a new graduate of Edward’s University, wrote in his application that he’s come to see that political campaigns and elections both reflect our culture and influence it. “I want to be a political strategist because I want to increase the political power of Black Americans and other demographic minorities through legislation, electoral politics, and community development,” Neal wrote. Sabina Erb, who recently graduated from Oklahoma State University, has been an intelligence analyst in the Air National Guard in Oklahoma and that experience sparked an interest in international politics and foreign policy. Another St. Edward’s University student, Jose Garibay, is a dedicated activist who has been working for the good of the community since he was 16. He loves doing the behind-the-scenes work and hopes the Campaign Academy will give him the tools and connections he needs to keep making a difference for those who are often marginalized and forgotten. Every one of the Campaign Academy participants wants to lead and serve their community. And I’m proud to be able to help them work toward that goal.